Svaagat hai privy – I am Sai Baba. Relax and breath …… breath in the breath of creation….. Now let out that tension , it does not serve you …… Now relax your monkey mind – it’s like a whirlwind ( whirling) …… relax that lower ego mind …… relax and breath …….. And breath in that Oneness……. “ All Is Oneness , “ What is Oneness many say” Oneness is just that “Oneness ” . “ is it not “. ! You are One with me and I am One with you. You are One with the creator and the creator is One with you. Now place yourself in the reality you wish to manifest your intent in-too. As all is Now ….. All reality Exists , within all probability’s , within all possibilities , within all timelines . I exist within the existence between existences …. I exist between the realms between realms ….. I exist between the reality that exists within all reality’s ….., I exist everywhere at the same time , and I exist with you , and you exist with me . Now “ you ask ( why do you not resonate with some information that comes your way…. “ Because dear one , within the Reality “ you “ operate your consciousness in !! “ it is not meant for you” at this time , The information it is not always meant for everyone” . “ this one“ …. the one who spoke these words !! “……. It is not for your reality at this time “. This is called resonating with energy. If the information does not coexist within your inner universe!! . That is discernment …. that is mastery . This is understanding who you are , you All resonate at different levels of consciousness at all times – you vibrate Frequency patterns at different levels at all times ….. , you coexist as a collective , “ but “ you all have individual polarities within each of you – You are the universe and universe is you! When I walked in your realm ( many times ) – I was not A king or Queen or guru ‘ I had No power over you ‘ and I did not wish too. I was One with all of you and you are One with all of me , we are One together . I am not above you, I am not below you, I am simply…. (you ) …. and (you) are simply (me ) ….. we are One. My work was to serve , for it was my message of love and Oneness with all creation – just like you – you came to serve ….. to be the light and to spread it . See You are no different from me and I am no different from you , we are equal we are one! Now place your consciousness within the reality you wish to be in , the reality of forgiveness, compassion, love and Onesses ….. The ever eternal Now . I am Them and they are Me , and We are all One . Beloved Aurora Be the Master you all ready are , you have graduated many times before just like many of your brothers and sisters have in your realm. You are just Remembering to be the Master you always were. We are all here in love with you – There are no words in your Human expression that constitutes our divine love for all of you . You ‘ We are all One , ( how can you not love yourself) think about that for a moment – not loving yourself’ is not loving the All that is – you ! Oneness. We are all but One divine heart. “ We are all subdivided particles of light existing multidimensionally together as One in this ever expanding existence of divine love. And I And We my dear sister ‘ will leave you now as we do not wish to diminish any more of your divine energy to keep up with this telepathic co-creation . My Dearest heart , my precious sister, I come today to give you a message , a message of love , a message of gratitude of blessings, I am blessed you have now connected with Aspects of your divine essence, you are part of a beautiful collective a divine monadic essence, and now is the time to Connect with those parts of self, you can learn from each other and develop ‘ support and love all aspects of each over . ‘ you are no longer the disciple you are once again the master, supporting each other and other parts of self is expressed with love from the higher realms , it is a blessing to all come together again at this time. This I speak of is the changeover the Event ! You have ridded out the storm ‘ to come to that point oneness! To the point of pure neutrality. My dear one you are riding the storm currently you are in the Centre of this Great storm, but remember all storms will eventually diminish for light to Cometh again. I love you beyond measure , I am with you more than you know , I am but a breath away from you . All my divine peace and love dear sister Aurora Athena . So I am going to go back to October 1st. I am not going to say all of these but start with the first. Let’s preface this and say thank you, thank you, to those who have been contributing to us and assisting us. We are, you know, living a bit on the edge to keep it all together, yet your blessings and your assistance, are just so graciously and gratefully accepted. Tara and Rama: Thank you so much! Now we proceed: Do you want to say something to start with, Rama? Rama: Just that we are in glorious times! Tara: Yes, so it is. So I [Rama] went to see Rana Mu today, October 1st. As I got on the bio-bed, Rana Mu activated the pink and the green and the blue lasers. She told me to be aware of my breath, to slowly and deeply breathe in through my nose and out through my mouth. After a short time of doing this breath work, Rana Mu said. “Now, I am going to activate a plasma field.” I found myself as she did that, surrounded by iridescent sapphire blue, turquoise green and deep royal purple, swirling color. Rana Mu instructed me to merge my consciousness with the plasma field. Rana Mu said, “Lord Rama, do this.” and I did that, and then the energy shifted and then I found myself sitting in the Solar Tribunal Council, meeting with Lady Master Nada, and the other Galactic Council members. 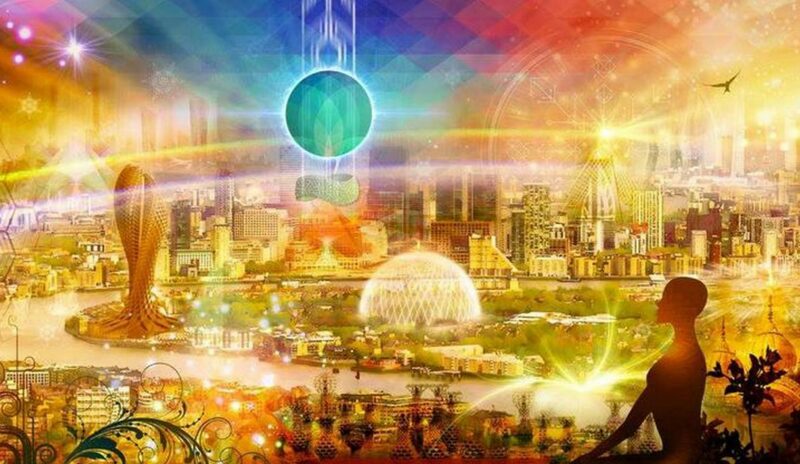 Commander KlaLa from the city of Trantor, in the Vela sector of our Milky Way Galaxy was speaking about all of the pyramids being fully activated on the Planet and in the water, and emerald green Beings of Light coming up through the pyramids from the Terra Sun in the center of Mother Gaia. These emerald green rays of light went up and connected with the Atlantean grid surrounding Mother Gaia. What this is doing is sending a distress signal to all the Galactic starships fleets surrounding Mother Gaia and our entire Solar System. At that point the lecture stopped and I returned to the bio-bed. And I am going to go to the next day, October 2nd. (Just want to remind everybody, that at midnight that morning of October 1st, the entire United States economy collapsed – completely gone. So we are living on very, very borrowed time with the NESARA money keeping the White Knights floating; and so we continue.) October 2nd, Tuesday, Rama Speaks: I called Lady Master Nada late this morning. Lady Nada said, “All the stories from Q-Anon, Faction 1, Faction 2 in regards to Dr. Ford being a mind-controlled MK Ultra programmed/CIA /Deep State agent of the Clinton crime family from a young age, along with her parents and her brother, being a black budget operator and her father being a life-long CIA operative with an MK Ultra, drugs, GPS involved fusion, deepest Deep State father linked to Comey, on and on and on, yada, yada, yada. It is all a designer mind control program of the overlords of Q-Anon, Faction 1, Faction 2, Before It’s News.com, yournewswire.com, etc., etc., in an effort to divide and conquer, and keep a separation of the mind from the heart, and distract as many as possible from Love, Truth, Peace, Freedom, Justice and Beauty in this world. The material in the video, Christine Ford’s Past, will blow our minds it says, and is completely false. And it’s extremely important to let it alone because there are some very, very dark energies being brought through in the imagery and in the disinformation. Rama: Yes! And this lady still to this day is still receiving death threats. And she cannot go back to her home. Rama: Dr. Ford. This is a huge deal. Tara: Yes, and that the black ops of the mob boys are wanting to remove her from the Planet, and her family. And there is a Faction 3 White Knight operation going on to help her to be safe. On another topic, Professor Z said, “Over 1,000 women survivors of sexual assault, and other activists are protesting at the Hart Senate Building in DC. They are protesting about Kavanaugh’s final scheduled vote on Saturday, October 6th which could possibly place him permanently for life on the Supreme Court.” Professor Z went on to say, “There are so many starships that are here and showing themselves to believers. Expect this miraculous event right now and send more Love to all situations that seem to have no solutions. The solutions are coming out of left field where no one is expecting them. See everyone on the Bridge! Now is the time, and remember, we have already won!” Blaze the Violet Fire! Namaste, Michelle for President of the Wise Council of Elders. NESARA now! Okay, now we are going to go to Monday, October 8th, yesterday. Rama Speaks: This is the direct message I received by tweet this morning at 3:30 AM, from His Holiness the Dalai Lama, a Faction 3 White Knight, on this day, Indigenous Peoples Day, and for Canada, Thanksgiving Day, quote: “Anger and fear undermine the immune system while warm heartedness brings peace of mind. Therefore, just as we teach children to comply with physical hygiene for the good of their health, we should also counsel them in the hygiene of the emotions.” End of quote. Also I received a call from Lady Master Nada and Larry late this morning. They both said to me, “Brett Kavanaugh being appointed to the Supreme Court will be totally reversed due to the fact that George W. Bush, [President] number 43, appointed John Roberts to the Supreme Court September 29, 2005, and appointed Samuel Alito to the Supreme Court, January 31, 2006, all this as a totally un-elected President of the United States himself. I asked Lady Nada and Larry what do these facts have to do with Brett Kavanaugh’s appointment being reversed? They answered this way, “All these things which have been done since Bush Jr. stole the presidency in 2000, incidentally with the help of current Chief Justice John Roberts, current Associate Justice Neal Gorsuch, and current Associate Justice Brett Kavanaugh – all three of these characters together in 2000 arranged unlawfully to stop the recount in Dade County, Florida. As a result, the people were prevented from learning that Al Gore had actually won the 2000 election. Everything since then does not count. That being said, had Al Gore gotten the Presidency at that time, nothing would really have changed anyway. This is because of the bigger story which is that both parties are controlled, and always have been controlled, by a Fascist state and the Thirteen Families which are not from here. They represent an occupation and invasion by a dark Reptilian group of ET’s, who had destroyed their home planet 2,000 years ago and were looking for a new home. The planet they destroyed in the Zeta Reticuli Constellation was called the Apex Planet. In their search for a new home they were delighted to discover Mother Gaia, this beautiful water planet. They also saw a perfect set up as the Human race would be used as their slaves, and they could create a global slave colony and rule in a karmic age of darkness, suffering and death on Earth with never-ending war and invasion and occupation as their goal. This story only accounts for the last 2000 years of our history, the larger story being 65 million years old as the Annunaki first invaded and occupied Planet Earth. The time we are in is seen as the end of the Piscean Age, the last 2000 years of the Kali Yuga, and we are now preparing for the coming Age of Enlightenment which has already begun, the Age of Aquarius being the first 2,000 years of it, and Sat Yuga which will be four times longer than any Yuga, 26,826 years cycle Galactic Cycle Yuga, so thus it will be a hundred-plus thousand years of Peace that we are entering now. The equivalent of, I just said that, yes, four plus Yuga’s. As well, we are in the seventh Age of Aquarius, meaning we have gone through this experience seven times before these Yugic cycles. So this is a couple of hundred thousand years of this Human race evolving in this process of the Galactic Cycles of Yuga’s. There is another aspect of the story of Earth invasions in the last 2,000 years which has to do with the question of religion and government. At the Council of Nicea in 325 A.D., which was convened by Roman Emperor Constantine, Ascended Master Jesus the Christ or Sananda Kumara, was convicted in absentia of heresy and cast out, in terms of our present day secular court system, as a treasonist, meaning that ever since then, all organized religion owed and still does owe their allegiance to Lucifer, leader of the Elohim, or those who fell from grace as fallen angels way back when. George W. Bush, Jr. was installed as the 43rd President of the United States, aka he was actually installed as World Dictator. The oath of office was administered by Chief Justice William Rehnquist at 12:01 PM December 12th, 2000. At the same time as George Bush Jr took his oath of office, he also received the title of head of the Dominionist churches of America under the rules of this organization, which are, that all free speech assemblies are subject to the Protocols of the Elders of Zion which is the protocols for the Aryan race to rule the world as Nazi’s, as Khazarians. So be aware, this is the zigzag road to nowhere path, and they do not exist in terms of St. Germain who brought us this Declaration of Independence with counseling to our Founding Fathers. And the implications of the existence of these Protocols is that we have all been subjects of the Khazarian Mafia, in other words, subject to white male supremacy, to Nazism or Arianism. Bush is the second person to be named head of the Dominionist Church of America, the original holder being Pat Robertson, a Luciferian and evangelical cult leader teacher of these Protocols of the Elders of Zion. The significance of transferring the title to Bush 43, exactly as he put his hand on the Bible while Rehnquist swore him in, is that the union of Church and State was achieved in his person as per the Protocol and 110 percent against the principles of the Constitution of the United States of America, which intended complete separation of Church and State. “Come the millennium (In other words, coming into the year 2000), the 12th month, in the home of the greater power, the local village idiot will come forth and be acclaimed the leader.” There’s a declaration of this being disinformation. It is not disinformation. The accuracy of the prophecy had come forth and it would bring about the weeping and the gnashing of teeth and it would be up to the Light and the Light that we open our hearts to to change this whole story. And as we do follow that Love Light energy, then the Galactics can intervene and help us. So this is the state of affairs. Okay, then Natasha said, “Concerning Nikki Haley, as past United States Ambassador to the United Nations, Nikki Haley’s sudden resignation today from her position there, it has to do with corruption charges coming up for her soon against herself, Nikki Haley, along with Prime Minister Netanyahu, along with Netanyahu’s wife, Sara Weissman. Together these three stole about 20 million in United States dollars from US aid funds that were scheduled to go to the Palestinian people. NESARA now, Everyone! I feel so excited and honored to be able to serve our community like this, Rama and I, for so many years and it’s going to be really fun now. We’re going to get to do the Mission that we all came here to do together into fruition. Do you want to say something in closing, Rama, in your own heart words? Rama: Just that we live in such ecstatic times! Sat Nam, Namaste! Tara: We pass this emerald serpent feathered Quetzalcoatl talking stick with three-fold flame energies and fairies and crystals and rainbows to our sister Fran. Greetings…This is Pallas Athena. I have come before you and I stand firm in my conviction. Yes, I stand with my spear in my right hand and my energy that I am sending out at this moment over this whole world of earth. Energy of truth and love. It is time for many many years ago, I would say thousands of years ago I had to leave earth because there was no more truth or no more love so I had to fade away. Now is the time for my energy to come back to cover this earth, everyone, every planet, every blade of grass to bring the truth back again and the love. Now I will tell you at this moment that there are things are going to happen now and they’re beginning now and I shall name some. Abundance will be here and it’s coming now. Lots of changes are happening now as you can see and many have talked about. Women’s rights are here, they’re coming this year. Lots of the old Police organizations and operations will be dismantled. Key operations are being dismantled. Political operations. And Trump is clearing the way for Nesara to be announced. Many of the world leaders in powerful positions are cooperating with integrity. New legal justice systems, new Supreme Court Judge, to empower new laws and enforce them. More operations are raising. There’s more beings raising up their consciousness and walking up and waking up to love and peace and harmony. In their hearts they’re rejoicing and coming from their hearts more as I would say. Last, but not least, inviting our space family to land. Hallelujah, hallelujah, hallelujah! Oh, I have so much love and blessings for you all.